For most of human history, we effortlessly consumed (nose-to-tail) the things we needed for health and happiness. Like the fertile ground that we once walked upon, we were a natural extension of this earth. In the modern world, we unknowingly struggle to fulfill our nutritional needs in order to support and sustain a vibrant, disease-free life. Our mission is our purpose... putting back in, what the modern world has left out. Traditional peoples, Native Americans and early ancestral healers knew that eating the organs from a healthy animal would strengthen and support the health of the corresponding organ of the individual1. For instance, the traditional way of treating a person with a weak heart was to feed the person the heart of a healthy animal2. Similarly, eating the kidneys of a healthy animal was believed to support urinary ailments and overall kidney health... Pancreas was fed to people with digestive problems... and spleen was fed to people with immune and blood deficiencies. Organ meats were a staple of our early ancestors' diets as the ultimate superfood, for good reason. It turns out, this nourishing tradition is backed by science... "Radioisotope labeling studies in animals have shown conclusively that, when eaten, organs and glands selectively travel to the corresponding organs and glands in high concentrations. This research, done at the University of Scotland in Edinburgh, lends credence to the ancient practice of eating animal organs to help ensure health in one’s corresponding organs..." - Dr. Ron Schmid, ND. Our early ancestors knew this, which is why their traditional diets included the frequent and nourishing consumption of nose-to-tail organ meats. FACT: Heart is the richest source of naturally occurring coenzyme Q10 (CoQ10). Optimal Heart Health "Like Supports Like"
FACT: Beef heart is rich in proteins exclusively found in heart tissue. When consumed, these proteins selectively travel to strengthen and support the heart of the individual. If you're going to pick just one ancestral supplement to start with, make it our GRASS FED BEEF LIVER... unless you need targeted support with another specific organ system. If you are going to pick two supplements, our GRASS FED BEEF LIVER and our GRASS FED BEEF ORGANS provide complementary and synergistic benefits. 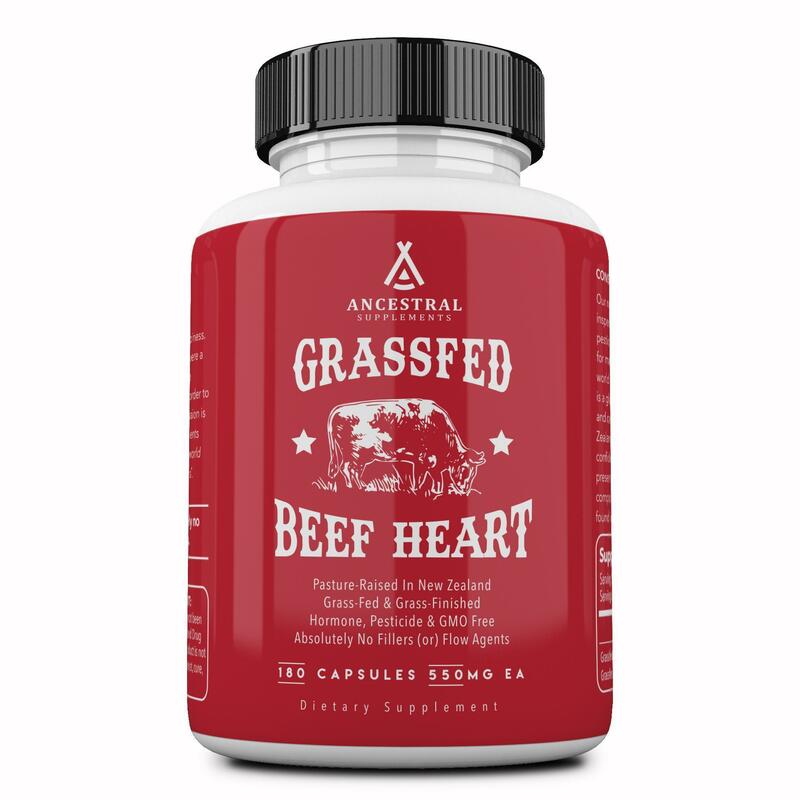 On the other hand, if you're looking for targeted organ support, you may be interested in our GRASS FED BEEF HEART to support a strong heart (or) our GRASS FED THYROID for thyroid support... you get the picture. Our genome has evolved with the nourishment of nose-to-tail dining since the beginning of time. 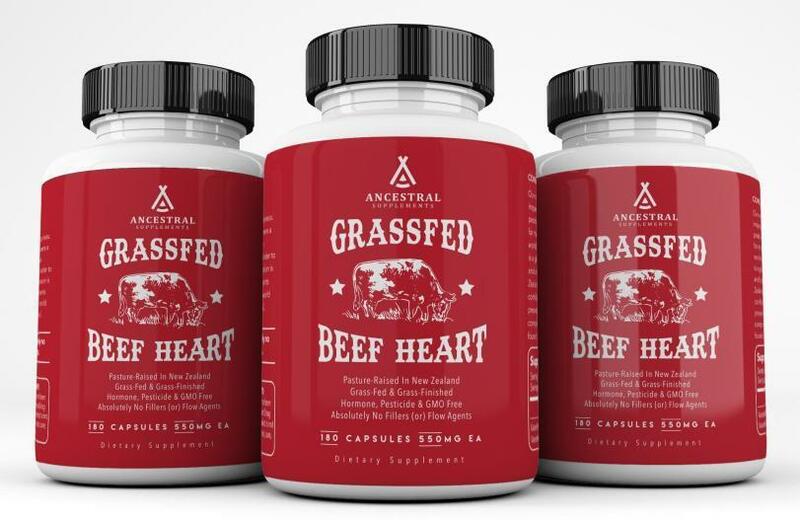 Grassfed beef heart is especially rich in the supernutrient CoQ10, vitamin B12, collagen and elastin, and proteins that are exclusively found and expressed in heart tissue. The health and happiness effects of consuming beef heart include strengthening and supporting one's own heart, blood pressure regulation and mitochondria health (the energy currency). Not all organ meats are the same. Look for a high quality beef heart that comes from pasture-raised, grass-fed cows that are hormone, pesticide and GMO free. If considering a supplement, look for one that is ultra pure (without binders, fillers (or) flow agents) and look for the freeze dried variety as these have been shown to optimally preserve nutritional factors and co-factors. For those interested, beef heart that is freeze-dried does not flow very well into capsules. The solution... add a little bit of freeze-dried liver. This is why and how we developed the constituents of our Beef Heart supplement (500MG HEART With 50MG LIVER). I frequently field questions regarding the addition of our liver as it relates to safety concerns. This section should cover it. Cold exposure benefits include boosting heart health through improved circulation and increased tolerance to stress, upgraded immunity, and enhanced metabolic flexibility. Rhonda Patrick, PHD writes “cold exposures increase cold shock proteins including one in the brain that repairs damaged synapses and in muscle prevents atrophy, how cold-induced norepinephrine lowers inflammation and pain by decreasing the levels of 3 inflammatory mediators…” This is very, very interesting stuff and it's grounded in evolutionary science.